June 17 is National Day in Iceland. 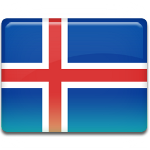 This holiday celebrates the foundation day of the Republic of Iceland. Iceland and Denmark signed the Danish-Icelandic Act of Union in 1918. According to the act Denmark recognized Iceland as a fully sovereign state, which joined it in a personal union with the Danish king. The Icelandic parliament decided to severe these ties and founded the Republic of Iceland on February 25, 1944. The corresponding law was passed to the effect on May 20-23 providing organization of a national referendum, that would reject of accept decision of the parliament. Majority of the nation voted in favor of republican independence. Celebrations took place on June 17, 1944, when the Prime Minister Björn Þórðarson officially proclaimed the Republic of Iceland. Celebration of National Day is associated with an annual parade. The parade is headed by the riders on horses, they are followed by the brass band and flagbearers from the Icelandic scout movement. After the parade several speeches are made, which ends an official celebration. Informal celebration includes musical concerts. Children love this day, because they eat as many candies as they can.